This Saturday, Buddy Murphy will face Cedric Alexander for the Cruiserweight Title. Tonight, we’ll take a look at both men. But first, Akira Tozawa will face Jack Gallagher. And in the main event, Kalisto will take on TJP just two weeks after TJP ripped off Lince Dorado’s mask. Good match. Gallagher dominated a lot of the early part of the match with his technical skill, but Tozawa opened things up with some dives. This was a fun, solid match, and I was happy with the finish. After the match, Drew Gulak and Brian Kendrick enter the ring. Gulak thinks his team is not living up to its full potential. Therefore, Gulak presents his Power Point, slide ten. He explains that there is no mercy on his team, and no place for weakness. He says Brian Kendrick is dead weight, so Brian Kendrick attacks Gulak and Gallagher before they can attack him. Gulak and Gallagher quickly double-team Kendrick and beat him up until they decide they’re finished. A look at the feud between Buddy Murphy and Cedric Alexander as well as their upcoming title match. Kayla Braxton welcomes Drake Maverick. Maverick says that the trouble between Mustafa Ali and Hideo Itami has to come to a conclusion. He says that the next time they face each other in the ring, it will be a match that no one will want to miss. Very good match. Kalisto started strong and frustrated TJP with an extended sequence of moves, counters, and reversals. 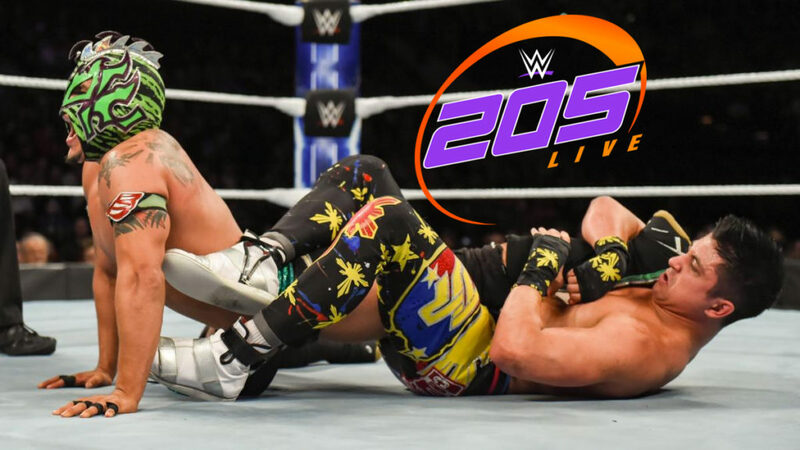 TJP would come back and dominate a large part of the match, but Kalisto would survive long enough to see TJP begin to get frustrated once again. The finish of the match was good, though I don’t think the last minute distraction was necessary. After the match, TJP rips of Kalisto’s mask. Lince Dorado and Gran Metalik run into the ring as TJP exits through the crowd. A good show. The main event wasn’t a feud-ended by any means, and I’m looking forward to more from TJP and the Lucha House Party. I was a little disappointed that Kendrick had a falling out with Gulak and Gallagher, but if it leads to Kendrick doing better as a solo wrestler, then I think it’ll all work out for the better. I’d like to see them have maybe some more back and forth rather than just trading dominant portions of the match, but I did like this match a lot as it is.